Time flies! The first ray of morning sun in 2018 will rise. At this moment, we will say goodbye to the fruitful 2017, and welcome the hopeful 2018. 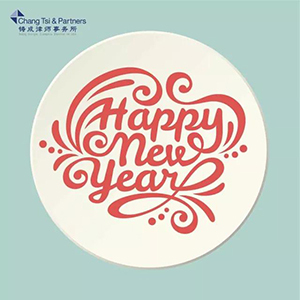 As the New Year is approaching, the partners and the Management Committee of Chang Tsi & Partners would like to express our most sincere greetings and good wishes to all colleagues who are dedicated, and make devoted efforts to the growth of Chang Tsi & Partners. We wish you all a happy New Year. In 2017, we witnessed the rapid growth and development of Chang Tsi & Partners, and the remarkable achievements that the firm has obtained in its 15 years in practice. In 2017, Shenzhen Branch and Hong Kong office were newly , thereby forming a service operation system scientifically distributed and having a reasonable architecture across Beijing, Shanghai, Guangzhou, Shenzhen, Hong Kong, and the United States, and completing a reasonable layout of the agency. Chang Tsi & Partners has recruited more talent to keep pace with the growth of the firm. We have taken the opportunity to add to our bench strength, thereby improving our overall quality and abilities, and thus our core competitiveness. We have formed an excellent team characterized by its high academic qualifications, inter-disciplines and globalization. This team has a common philosophy and humanitarian concern, thus serving as the backbone of Chang Tsi & Partners. The total number of our team has risen to 300. In 2017, Mr. Fu Tongjie became a new partner. In addition, another 79 attorneys became new partners, senior service consultants and other service members, marking a 22% increase as compared with 2016. Among them, the partner Ms. Zhong Chun is a PhD in Competition Law, a post doctoral graduate in Intellectual Property Law, a well-known expert in the field of antitrust law, and an author with many works to his credit. Mr. Chen Xiaoliang is a senior lawyer and patent attorney, and has worked in SIPO and the Intellectual property court of Guangdong High People’s Court for more than ten years. He has participated in hearings for a host of major and complex cases, and has abundant experience in primary examination and trial - a number of opinions provided by him have been accepted and used as the judicial interpretations by the Supreme People’s Court of The People’s Republic of China. Sun Hailong graduated from the Chicago-Kent College of Law, and majored in International Intellectual Property Law. He has been in this field for over 20 years, and is a senior patent attorney. Senior patent attorneys Ms. Lin Lei and Ms. Han Wei graduated from The University of Sheffield and Newcastle University, respectively, and have more than ten years’ experience in IP prosecution and management. Patent attorney Mr. Lu Jiayi has joined to firm. His specialties include standard-essential patents and antitrust law. Patent workflow manager Ms. Wen Yamei graduated from Peking University. She has been devoted to international patent workflow management for 15 years and now shares her experience with our many clients. 2017 witnessed sustainable and stable growth of our services, wherein, the trademark service volume experienced a continuous and stable growth. Patent service staff increased as our patent services increased. The industries involved also widened to include new energy, augmented-reality, virtual reality and other high-tech fields. The quantity of legal cases in our firm greatly increased, with the service sphere relating to fields such as valuation adjustment mechanism (VAM), stock right exercising, and intellectual property law consultation, and more and more domestic clients cooperate with us, expecting to establish a favorable IP management system for enterprises in China by means of our experience in serving Global 500 clients. The quantity of litigation cases saw a huge increase, exceeding 300 in 2017, among which, over 10% were tried in the People’s High Courts and the Supreme People’s Court of The People’s Republic of China. With the infusion of new talent into our service team, our service areas are now further expanded. In the field of Corporate Law, we provided specific services in terms of due diligence, appreciation of intellectual property and commercialized operation for numerous large listed companies and VC projects, and provided IP strategy study and overall planning of IP management for large-scale enterprises at home and abroad. We have explored new approaches to administrative complaints against patent infringement, and made favorable explorations and experience accumulation for related work in the industry. 1. Shantou Chenghai Jianfa Handbag Craft Factory vs Michael Kors (Shanghai) International GMBH, Michael Kors (Switzerland) International GMBH, Zhejiang Intime Store Inc., and Beijing Jingdong Century Trading Co. Ltd.
2. Under Armour against Fujian Tingfeilong Sports Goods Co., Ltd. regarding trademark infringement and unfair competition. 3. Guinness World Records against Chery Automobile Co., Ltd. and Anhui Chery Automobile Sales, Co., Ltd. regarding trademark infringement and unfair competition. 4. Graco Fluid Equipment (Shanghai) Co., Ltd. vs Shanghai Sanqi Spray Dope Equipment Co., Ltd. regarding trademark infringement and unfair competition. 5. Trademark administrative litigation case of Shanghai Zhendi Decorative Material Co., Ltd vs Trademark Review and Adjudication Board. 6. Kohler against the Patent Reexamination Board regarding administrative litigation against patent invalidation and patent infringement litigation. 7. The case of People’s Procuratorate of Hefei High & New Technological & Industrial Development Area vs the crime of selling commodities bearing a counterfeit registered trademark committed by XU Lin and LI Yufu. Throughout 2017, we have made further adjustments and improvements to the service support and workflow control system in the firm, to improve the quality of services. We have made adjustments to the support departments by integrating the trademark and patent workflow administrators, such that the workflow management will be more scientific and standardized, staff allocation will be clearer, and the office efficiency will be further improved. We focused on adjusting the patent service structure, by separating the patent workflow department from the patent service department, and divided the patent services into three modules, i.e. national services, international services, patent dispute services, so that the division and cooperation of patent services are more scientific and explicit. Meanwhile, we have further reorganized and optimized the firm’s standard operation procedure (SOP), thereby laying a foundation for scientific and standardized management. To improve time management, we have spent time and effort to construct an Office Automation system so as to digitize our operations in furtherance of a paperless office. We have upgraded our hardware systems, to get one step closer to a truly paperless and electronic office. This move saves resources, and maintains a clean office environment, thereby improving work efficiency, and meanwhile, creates conditions for working remotely. We never forget why we started. We have launched various public welfare activities, and carried out our social responsibilities as a business entity in 2017. We persistently carry out tree-planting public welfare activities, i.e. Chang Tsi & Partners Forest, and all staff planted the second batch of saplings in Chang Tsi & Partners Forest. We have been aware of the importance of environmental protection, and have put environmental consciousness into practice by recycling paper, saving water, taking reusable bags when going shopping, and drinking less bottled water. We have made donations to Doctors Without Borders and American Institute for Cancer Research once again, and see this public activity as a long-term public welfare program. We have joined the project “Umbrella for Little Stars,” which is aimed at caring for families with autistic children. 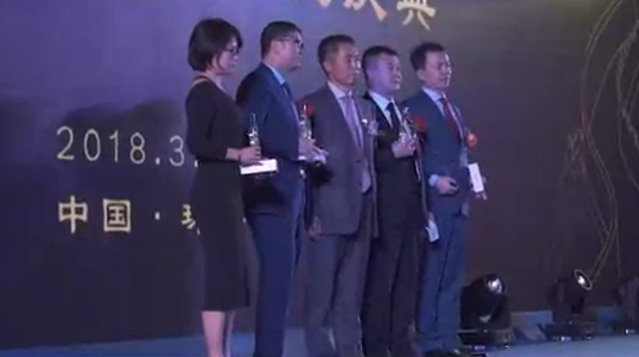 Lawyer Xu Liang from Shanghai Branch, on behalf of Chang Tsi & Partners, reached the final and won an award. In 2017, we continued to follow the experience and tradition in culture construction formed in past years. We hosted the first Chang Tsi & Partners Princess Day and Secretary’s Day, organized photography and essay writing activities, made suits for all staff, invited external experts to give lectures on mental health, and doctors of traditional Chinese medicine to provide training to staff. We continued Springtime excursions, New Year celebration, and birthday activities, badminton and basketball games, as well as Chang Tsi & Partners Family Day. Our objective is to create and maintain a sense of family and belonging in members of the firm. This means that when any one of our staff encounters sudden difficulties, the rest of us can reach out to provide support. This fully demonstrates the warmth and fraternal love in Chang Tsi & Partners. The philosophy of Chang Tsi & Partners are reflected by these activities: Chang Tsi & Partners is not only a workplace and a place to build a career, but also a big warm family. We are not only partners in work and business, but also friends and family members. It is this philosophy that pushes us to continuously innovate and develop. Due to our outstanding performance in corporate culture and employee relationships, we have been elected as “2017 China Employer of Choice” by Thomson Reuters and “Beijing Advanced Harmonious Labor Relations Unit” in Beijing, and have been recommended and selected as The Chinese Backbone advanced unit by All-China Federation of Trade Unions. We continued to attach importance to staff training in 2017. We devoted more energy to training, and provided internal and external trainings to both full-time and part-time staff. According to the statistics up to the end of November 2017, we have organized 124 trainings, including 103 internal trainings and 21 external trainings. In 2017, Chang Tsi & Partners once again won a host of annual big awards by many authoritative legal rating agencies and media in more fields, and this further improves our reputation in the industry. Chang Tsi & Partners was voted as “Best Intellectual Property Firm in China” by Chambers Asia Pacific for consecutive years once again. We earned the honor to be a law firm highly recommended by Asialaw Profiles, and were recognized as “Outstanding Trademark Agency for 2016-2017” by China Trademark Association (CTA); the “Best Chinese IP Firm” by International Legal Alliance Summit & Awards, and “Recommended Patent Firm in China” field by IAM Patent 1000. Spring Chang, our Founding Partner, was ranked as “Band 1 Lawyers on Intellectual Property: Non-litigation (PRC-firms) – China” by Chambers and Partners, and Simon Tsi, our Managing Partner, was listed in China’s Top 100 Lawyers by China Business Law Journal. 2017 is a year that all of us in Chang Tsi & Partners are proud of. In the 15th year anniversary of Chang Tsi & Partners, we created splendid achievements once again. 8. Further optimize the management level of the law firm, improve the construction of assessment, and reward and punishment mechanisms and systems, and comprehensively improve the execution of all work in the law firm. As the New Year begins, let us also start anew. We are full of hope and confidence to the upcoming 2018. Let us work together with heart and soul and relentlessly, and spare no pains to fight for new glory of Chang Tsi & Partners.